Your non-emergency number is the number you should use to report all non-emergency situations. Using your non-emergency number allows your 9-1-1 center to better prioritize calls and gets help to those in life or property threatening situations as fast as possible. Your non-emergency call may take a little longer for dispatch to answer - please, don't hang up! Your call is important to us and the agencies we serve! The non-emergency number for Washington county is 503-629-0111. 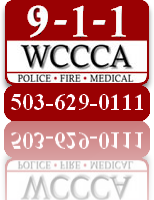 Here is a complete listing of non-emergency numbers for the Portland Metropolitan area. Everyone knows to dial 9-1-1 in the case of an emergency. While most everyone knows to dial the non-emergency number in case of a non-emergency situation, not everyone knows that non-emergency number. That is why we designed our new 9-1-1 stickers with the non-emergency number more noticeable. If you would like to receive "reminder" stickers that can be placed near phones or in public areas, please fill out our sticker request form. We will send the amount requested to the address provided. In addition to the standard 9-1-1 sticker, we have a 9-9-1-1 sticker available for organizations who have phone systems that require users to dial 9 to get an outside line. If you would like to receive this type of sticker, check the 9-9-1-1 sticker type when requesting stickers. Please fill out the form completely. The requested items will be sent to the address provided. Allow 1-2 weeks for delivery.